First, lets talk about the Flycam. With the Flycam 360° you can download their editor "360 Fly Director" from their website 360fly.com. 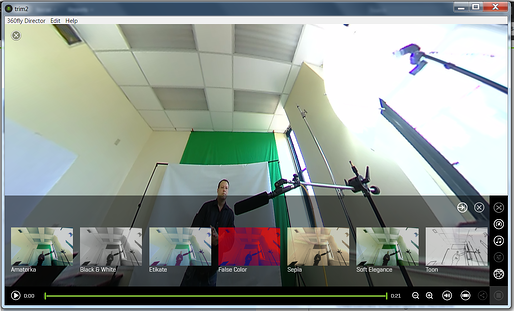 Once the software is installed on your computer you can connect your camera and drag the footage into the software interface or you can copy the footage from the camera onto a hard drive then import the footage into 360 Fly Director. Editing is limited with this program, you only have a few options. One of those options: trimming the footage. If you choose this option and trim a piece of footage you must re-save that trimmed piece of footage under a new name. Once you have all of your pieces are trimmed, you can merge those clips into one longer video clip. Along with the trim and merge functions you also have the ability to add filters and change the projection(s) of the camera. The 360 Fly Director also gives you the ability to edit some audio, meaning you can remove the audio all together or you add a piece of audio to the clip (let's say your favorite piece of music). Below is a snapshot of the 360 Fly Director editing interface showing the different filters we can apply to the video clips. Overall the picture quality is not too bad on the Flycam 360. You might not call it true 360 because of its in-ability to shoot down but that little annoyance won't make me lose sleep at night. The editing is a bit limited and work flow not conducive to a professional setting, but the camera is a great starting point for anyone interested in shooting 360 video. It comes with various mounts so you can get into all kinds of cool trouble with camera. However because the editing process was slow, laborious and not time conducive we abandoned using this camera all together unless it's for a situation where we can lose it. 2. Upload/import the footage to the 360 Fly Director software. 3. Edit (trim, merge, filter effect, projection setting) the footage in the 360 Fly Director software. 4. Export the footage from the 360 Fly Director software, then import it to the 360fly.com web portal for sharing and embedding options. 5. Copy the embed code or share the video right from the 360fly.com website. The Bublecam process was bit more forgiving for us even though we used a stand-alone editor for this. 1. Embed/Share the video right from there. 2. Re-download the footage for editing. Once you upload the footage to their cloud site, the footage gets wrapped in equidistant projection. This means you can download the footage from their website and bring it into any standard editing program to edit (Adobe Premiere, After Effects). Once in the editing program you will have to be careful about the audio. If you thought ahead, you used a separate microphone to record the audio because bublcam's built in mic is not on the professional level yet. You'll have to sync up the separate audio and video files (if you have separate files). If not, then it's one less step you have to worry about. Basically, you edit the footage like you would any other footage. Take note however that the size of your composition or sequence will be bigger than usual. This accounts for the 6 camera feeds and the equidistant projection format. Once you have the footage edited, render out the footage and re-upload it to the Bublcam site. From there it gets' put into a wrapper where we can then embed or share it. 1. Shoot footage with the Bublcam. 7. Share / embed the footage. Even though there was an extra step or two when working with the BubleCam, the overall editing process and work flow was much easier. Plus, we had many more options editing the footage using Adobe Premiere then we did with the FlyCam. As a camera itself, the Bublcam will only get better as lens technology gets better. The 360 pictures taken with the Bublcam can look crystal clear if taken in good light, however the video quality is step below the picture quality. Because of it's universal screw mount, we were pretty much able to mount this camera to anything, including other cameras and cars. Though the bublcam is a bit bigger than the Flycam, the size factor didn't seem to be an issue ever. Overall, the work flow and ease of use of the Bublcam and the ability to edit in any program make it the ideal choice for us. So why would one be interested in 360 video editing anyway? Many retailers, manufacturering and distribution companies have already embraced the 360 video technology. They know it's presently possible to run 360 video ads through True View (YouTube's choice based ad format). When presented with video 360, consumers not only watched the videos longer but were more willing to share, subscribe and check out other videos from the same company.